I discovered Micanopy quite by accident. Not having grown up in Florida, I know precious little about the state history. However, as time goes on and my interest in historical places and settings grow, I find little hidden tidbits. Yes, James Taylor mentions Micanopy in a song; and Michael J. Fox filmed Doc Hollywood in Micanopy, but I hadn’t paid much attention to those tidbits. A few years back we were visiting Paynes Prairie State Park and stumbled upon a sign pointing to Historic Micanopy, so I followed the road and was surprised to find this cute little place. Did you know that Micanopy was the first established town in the state of Florida after it became a part of the United States? 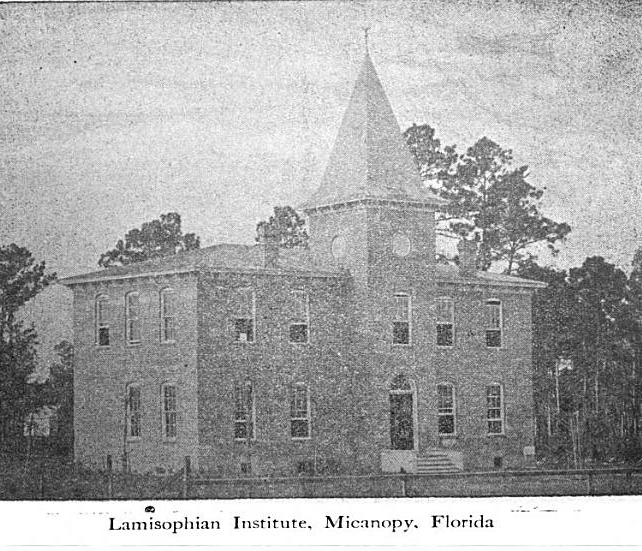 It was settled in 1821 by Moses Elias Levy, and he named it after a Seminole Chief, Micanopy. The town is just barely over one square mile. So if the road didn’t end you could blink and miss it. There’s a used bookstore in town and I’m afraid hubby and I spent a lot of time in there. I found original newspapers from Springfield, Mass put in a library binder. If I had extra I would have purchased one, but the extra wasn’t there right then. However, I do know where they are and if the extra becomes available…well, let’s just say they might find a home. In Micanopy you drive less than 20 mph. There are quite cafes, antique stores, a museum, town hall, fire department, etc. Here are a few pictures to give you a feel for the place. Historically, it was the home of a Methodist Seminary for both men and women from around the world. After the Civil War it became a Baptist Seminary. Below is a rather old photo of the Seminary. There was also a large lake, and water travel permitted easy access to Micanopy that is no longer the case. It was also the location for the first of the Seminole Indian wars. A military post was established there in the 1830’s. Fort Defiance was erected in 1840. It was an intense fighting situation which—if you are familiar with the Seminole Wars in Florida—you are aware of how hard it was on both sides. In 1854 a petition to the state was requested to form a “Plank Road” from Palatka to Micanopy. Palatka is on the St. John’s River and was a major stop for the steamboat industry. In fact, Palatka was… I’ll save that for next month’s post. After the wars Micanopy settled into a quiet location with rich hammock filled lands and large plantations and orange groves (outside of the town). Today it is a quiet and great historical place to visit. If you’re traveling in Central Florida you might want to stop by. You’ll be glad you did. If you like historical tidbits you might like to visit my blog 19th Century Historical Tidbits. You can also follow me on twitter @LynnColeman or you can friend me on Facebook. My next novel "Courting Holly" is scheduled to be released in Oct. 2013. Oooh a hidden treasure! I love finding those little gems off the beaten path. Sounds like a wonderful quiet little place to visit, it will have to go on my list to see someday. Thanks for a fun post! You're welcome Susan. Let me know when you travel there. What a quaint little town, Lynn. Thanks for putting it on the map for me. Interesting that James Taylor and Michael J. Fox both gave it 15 minutes of fame, too. Looking forward to next month's followup. Those are fun tidbits aren't they? thanks for sharing this little bit of history with us. You're welcome Paula. Let me know when you travel there. LOL I know what you mean Pam. Sounds like a neat town - I had never heard of it either, & love quaint little towns! Thanks for the info! Sounds like a town right out of a book!..thanks for the info! Love your name Eliza I have a proposal with that name, haven't sold it yet but I do enjoy fun names. What fun to read about this. I love that little town. The University of Florida used the opera house for some of its art classes--sculpture, mainly, because we were using plastics and they had strong fumes. When we crossed Payne's Prairie from Gainesville in the springtime, we'd see dozens of water moccasins crossing the highway. It's also not that far from Cross Creek where Marjorie Kinnan Rawlings wrote _The Yearling_. My friend and I went into the little general store for a Coke and when we came out, a little kid was standing there with an ice cream cone and a big hound dog came up and licked him on the face. Lucky he didn't get his cone. So cute. Thanks, Lynn, for bringing up the memories. You're welcome Margo. I've been to Payne's Prairie and Marjorie's place too. They're about 45 to 60 minutes from my place. Thanks for enlightening me about Micanopy. I thought it was an Indian village! Looks like I need to check it out. You're welcome Marilyn. If you do go let me know.